When you host a smaller event that doesn't require a fully catered meal, hiring a catering company might still be worth considering. Private catering can provide your guests with delicious, expertly prepared appetizers. Examples of appetizer only events include small wedding receptions, cocktail parties, grand openings, and media events. These events can be made more special with a variety of appetizers. Smaller events where assorted hor d' oeuvres are on the menu adds a lot of freedom to party planning. You can included a variety of foods that work together and add to the atmosphere. By providing a limitless selection of appetizers, your guests can pick and choose their favorites. The true challenge is menu selection – with so many options, what should you serve? Who doesn't love a good cheese platter? 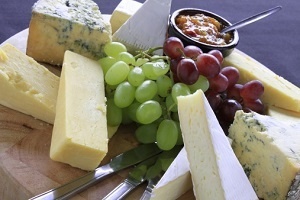 Offering your guests a variety of cheeses is a classy way to kick off a party. Select your cheeses with care, and make sure they are all labeled. It's always wise to provide a wide variety of textures and flavors when selecting cheeses; try choosing cheeses that are soft, firm, aged, and blue. It’s also good to keep the preferences of your guests in mind, and be sure to serve at least one familiar cheese. Lastly, keep special dietary needs in mind. Be considerate, but don't be afraid to offer some adventurous options! Of course, a cheese assortment wouldn't be complete without meat and crackers. Another crowd-pleaser, chicken wings are a universally loved catering staple. 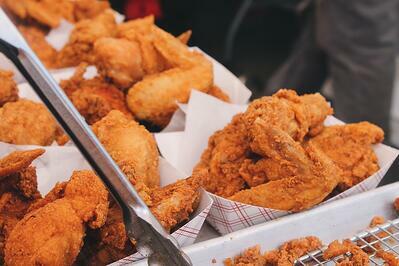 Chicken wings are ideal for small events because they straddle the line between an appetizer and full-blown entree. Again, chicken wings are compatible with a wide variety of flavors, allowing you to accommodate many themes. Flavors you might try include teriyaki, buffalo, barbecue, or seasoned. 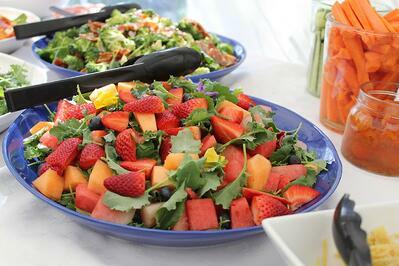 Fresh fruit appetizers are a lighter alternative to traditional appetizer options. Seasonal fruits can be served in a variety of ways, including kebab or platter style. In addition, you can drizzle fruit with chocolate to easily transform this appetizer into an impromptu dessert tray. An assortment of crackers is a perfect accompaniment to this healthy appetizer option. This mouth-watering dish is perfect – it's a crowd-pleaser, and it's easily kept warm during lengthy events. Meatballs are a very versatile dish, and the range of flavors you can offer your guests is staggering. 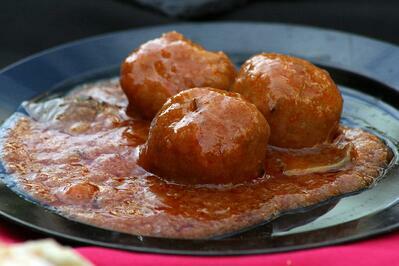 Some of our favorites include meatballs in a savory gravy or sweet and smoky barbecue sauce. Jumbo shrimp are delicious any way they're prepared. Shrimp is a versatile appetizer that can be prepared to take on a number of different flavors and satisfy a variety of preferences. 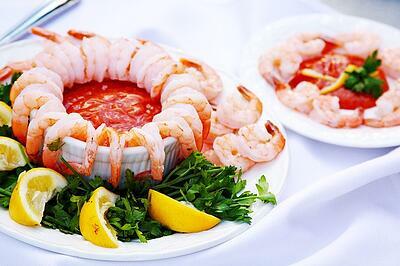 Any number of sauces can be served with shrimp; consider offering a wide variety for your guests to try new things. Baked, sautéed, marinated, bacon-wrapped, or simply served cold over ice – shrimp can be an excellent hors d'oeuvre for any type of event. 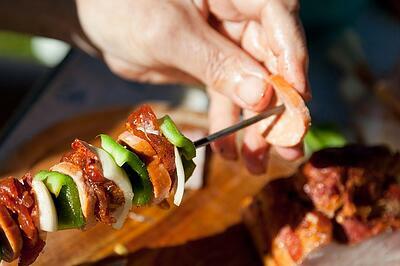 Brochette is a popular appetizer for small events due to its flexibility. They can be served with any number of meats, vegetables, or fruits. For this reason, they are typically a safe bet for guests with picky appetites. If you're worried about a lack of variety in your event's menu, try a delicious teriyaki chicken brochette platter – it's the perfect solution for guests seeking variety in their appetizer. Small Party Catering with Nelson Bros. Serving a full meal isn't the only reason party planners choose to work with a catering company. Small party catering is a regular service we offer, and those who choose it are oftentimes surprised at the amount of stress and responsibility it relieves. If you're in need of catering services in St. Cloud and the surrounding areas, feel free to contact us. You can also click below to view our menu, with prices.